This new bag is perfect for carrying around smaller R/C essentials, particularly bottles of Silicone Oil (e. g. Items 54707-54718) for your shocks, protecting your things in case of unexpected spillage. Internal dimensions (approx. ) : 120mm (W) x 190mm (L) x 120mm (H). Can safely carry a load of around 1 kg. Capacity for fourteen to fifteen 40cc bottles of shock oil. Provides a safe, double-zippered means of carrying around R/C parts and accessories. 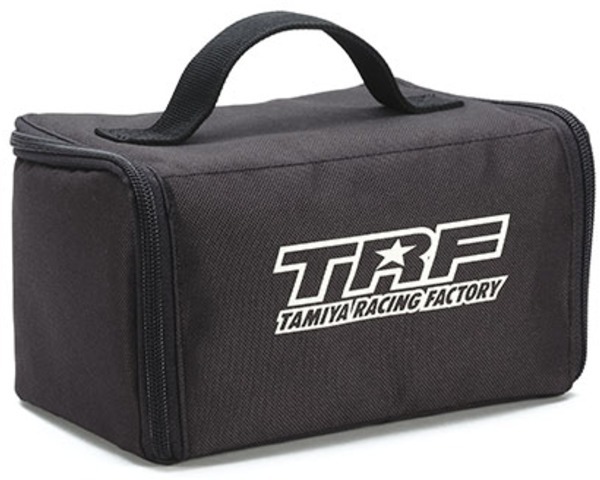 Comes in black with the TRF and Tamiya logos printed on the side in gray. Easy to carry thanks to compact handle on top.